I first spotted the second feline in this series on July 8, 2016; Roly Poly (my nickname) playfully tortured a black cat behind a hedge on Cleveland Ave. just beyond Monroe. 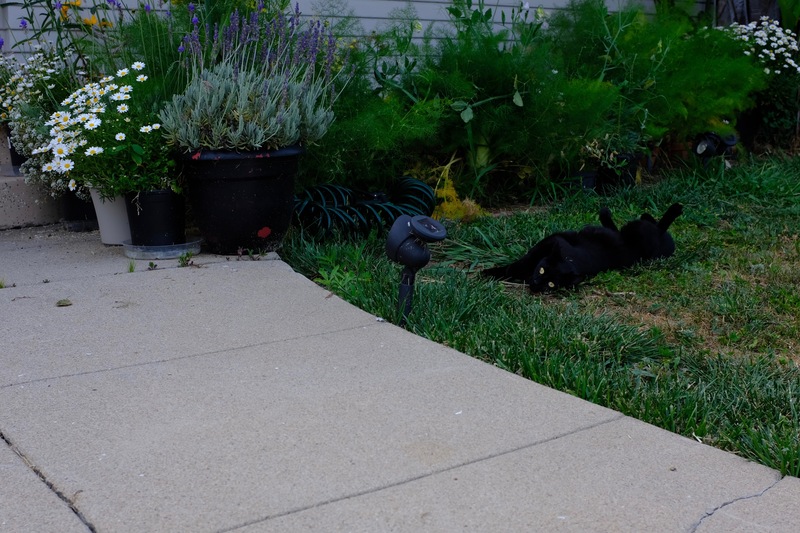 Three days ago, and two doors down from that earlier sighting, what could be the same blackie rolled happily on a front lawn. The Featured Image is the last of 11 shots, chosen for the kitty’s posture. I cropped but did not otherwise adjust the arguably contrasty composure as captured with Velvia film simulation using Fujifilm X100F. Vitals, aperture manually set: f/5.6, ISO 200, 1/180 sec, 23mm; 4:13 p.m. PDT. Blasts from the past: Scruffy, Roly Poly, Woo, Skull, Biscuit, The Colonel, White, Chipper, Frisky, Stretch, Needy, Farfisa, Mates, Hunter, Pee-Pee, Blue, Blue Too, Bonded Pair, Patience, Fess, Jumper, Frenemy, Looker, Cozy, Scout, Lurks, Skit, Mini, Betty, Black and White, Stalker, Bell, Chill, Sammy, Scratch, Poser, Star, Grey and White, Watcher, Herman, Comet, Roman, Willow, Chub, Nimbus, Watson, Lilo, Kit, Pepe, Twilight, Sebastian, Spot, Booger, Ash, Veruca, Riley, Mellow, Bonde, Flower, and Glass.